June 2016 was wet in Surrey with over 246% of normal rainfall. SE England as a whole received 113mm of rain, 208% of long term average. At 118.4mm, Surrey was the wettest county in the UK regarding anomalously high precipitation. Despite this, both 1971 and 2012 were wetter months. 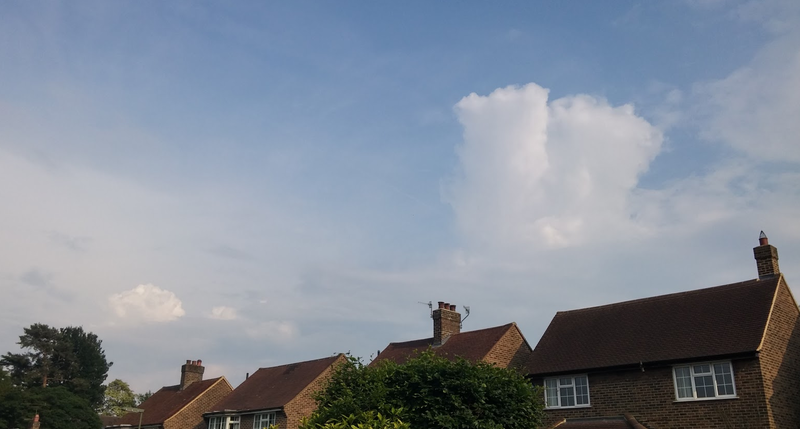 The rain was delivered in a number of distinct heavy showers and convective thunderstorm events, notably on 23 June when parts of South London were especially badly flooded in flash flooding during torrential rainfall of more than 50mm in one storm. The heaviest rainfall was characteristically patchy so not every part of Surrey experienced the same soaking, some parts were a lot wetter than others. For example, while Caterham received over 40mm in one thunderstorm, Reigate received only 10mm from the same storm. 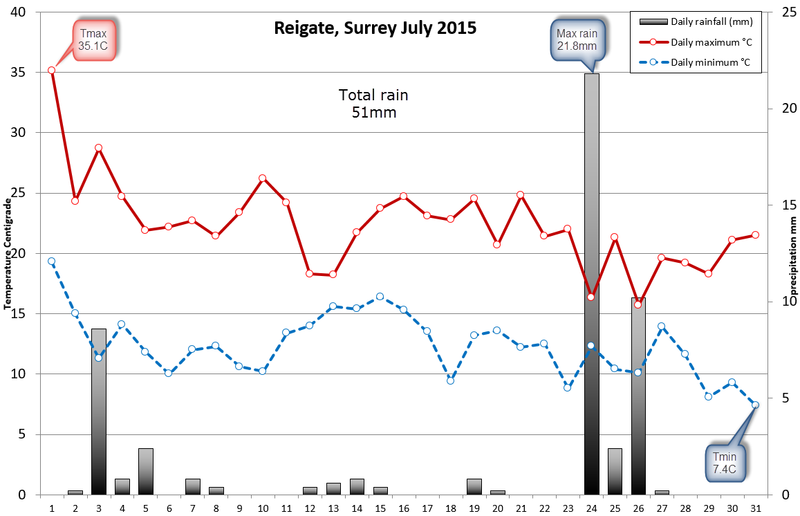 In total, Reigate received 100mm of rain in June which compares with 15mm for June 2015 and 30mm for 2014. A thunderstorm on 23 June brought an amber warning and local flooding and lightning damage to some places in the SE. Below are some news reports from the time. A shelf cloud was spotted over Reigate, one of the first observed over the town. Horsham experienced intense lightning and one bolt struck a conifer at 2am which was destroyed in a spectacular explosion. Fortunately no one was hurt, but cars and property was damaged. June started well but pressure fell from 10 June and the month remained mostly unsettled thereafter. 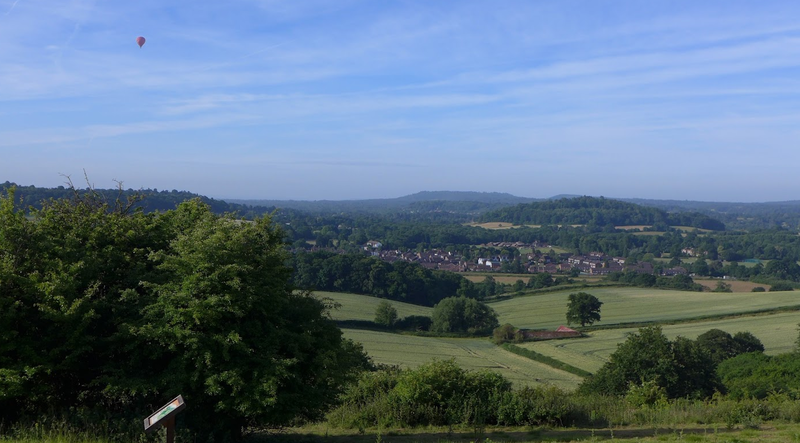 Due to the unsettled conditions and rainfall and associated cloud, June was less sunny than usual, with only 114 hours of sunshine recorded in Reigate. June 2015 had 192 hours of sunshine in comparison. June was just about 1C above the long term 1981-2010 UK average at 13.9C. Reigate recorded a monthly average of 16C which is considerably higher than the UK average being located in the warmer SE. Globally June 2016 was the warmest June since records began in 1880 and was the 14th month in a row to beat global long term average temperature. The charts below show NOAA, NASA and UAH global temp anomaly maps for June. All agree that June was hot. With one month after another breaking heat records, 2016 is easily on target to be the hottest year on record despite a waning El Nino. This continues the inexorable rise in global temperature in recent years. April 2016 cool in #Reigate : how can it possibly link to early melt-season in Greenland and wild fires in Canada and the seventh hottest-ever month globally in succession? How can there possibly be a link between a modestly cool month in Reigate and the earliest start to the melt-season in Greenland, the devastating wild fires in Canada and the seventh hottest-ever global month in succession? 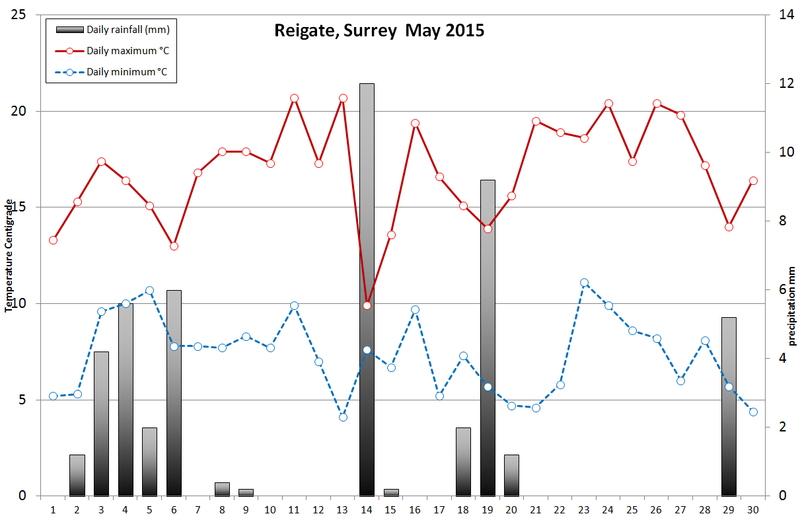 Reigate, like the UK as a whole, had a cooler than average April at 8.2C. The town even experienced some unusual snow showers on 26 April in a cool northerly air flow. The cool month for the UK is in stark contrast to the bulk of the planet which experienced a much much warmer month than average, at over 1.1C warmer than any previously measured April. Astonishingly, this is the seventh month straight that has brought record breaking global temperature anomalies. This continuing succession of warm months globally should be of concern to everyone. More on this below. Back to the UK… The Central England Temperature came out at 7.5C, 0.4C below average, and the UK mean was even lower at 6.5C, 0.9C below the long term average. Rainfall was about average in Reigate with around 40mm of rainfall. The MetOffice SE figure came out at 55mm. April was sunnier than usual with a total of 140 hours of sunshine. This continues the trend of drier and sunnier Aprils in the UK in recent years. The first half of April was unsettled with most of the rain falling associated with low pressure systems and fronts. The second half of April saw an unusual cool period as northern blocking over the Arctic sent cool northerly winds south with attendant sunshine and showers. Globally April was the warmest ever April on record. An anomaly of 1.1C sent the Paris target of keeping global temperatures below 1.5C into grave doubt as this is the 7th month in succession to yield much higher temperatures than ever. This is now being dubbed a “Climate Emergency” because of the sudden and rapid increase in global temperature to levels not expected to occur so soon. The UK / NW Europe was about the only part of the planet, with NE Canada, to record below average temperatures. The cool spot over the UK was due to northern blocking (high pressure) over the Arctic. As pressure rose over the Arctic, cold air pushed out into mid-latitudes. It is a matter of chance where high pressure and low pressure set up that determines where cold polar air penetrates in these northern blocking scenarios. This time the pattern sent the cold air to the UK and N Europe. The Northern Hemisphere as a whole saw anomalously low snow cover as a result of incredibly high temperatures elsewhere. Arctic Amplification, where the northern latitudes experience highest rates of warming, is well documented and of increasing concern to climate change. It is acting as both a response and a further driving force behind rapid climate change. Temperatures rocketed over the Arctic this cold season with temperature departures over 3C widely across the Polar regions. The Greenland ice sheet experienced one of the earliest starts to the ice melt season on record. Arctic Sea cover also recorded another record low maximum winter extent. This is both a response and a further catastrophe for climate change. As snow and ice melt in the Polar regions there are connections with further warming as darker sea and land surfaces heat up more readily. This Polar warming itself is connected with a weaker jetstream as latitudinal temperature gradients in the atmosphere decline. It is temperature gradient, especially in Mid-Latitudes, that generates the driving force behind the jetstream. A weaker jetstream is said to cause more blocked atmospheric conditions as it meanders with greater amplitude in a meridional pattern that locks in swoops of northerly and southerly winds. More extreme weather is caused as these pressure patterns persist for longer. Sweeps of warmer air penetrate into the Arctic, melting more ice over Greenland and, for mid-latitudes, cooler dry Polar air leaks out causing damaging late frosts and wild fires. So, whilst it seems tenuous to connect these far-off events to our own rather benignly cool April, it is still important to think globally when considering how our own weather links to increasingly extreme weather elsewhere. February 2016 weather statistics for Reigate, Surrey, England. Storm Henry opened February weather with inclement wet windy conditions for the far NW but no significant impact here in the SE. 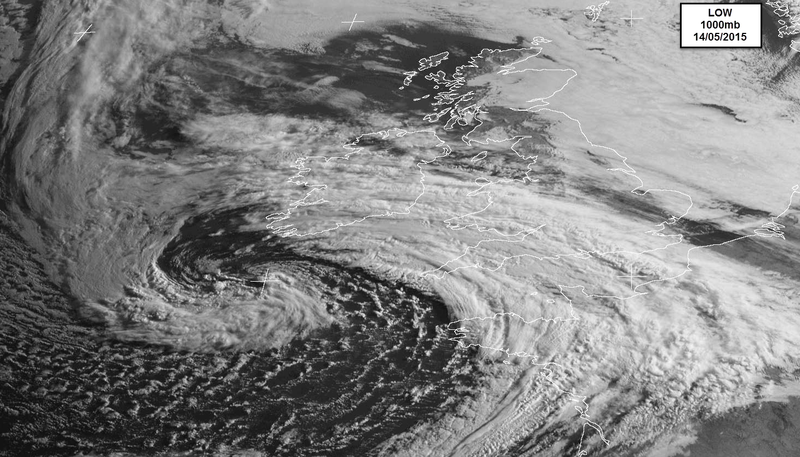 Storm Imogen on the 8 Feb impacted Wales and the SE more with the highest gusts of the month exceeding 41mph here in Reigate, with a max gust of 81mph on the Needles, Isle of Wight. February was another mild winter month, though not on the scale of record breaking December 2015. February UK average was 3.9C, the Central England temperature (CET) for Feb was 4.9C, an anomaly +1.1C above the long term average. Locally our February average was 5.3C showing that the SE was warmer than the rest of the UK. February was the sunniest winter month with nearly 100 hours of sunshine, compared to 94 hours in January and a dull 80 hours in December. The mean 500mb heights for the month (above) shows a trough placed over the UK for much of February and an overall Atlantic flow bringing milder than average temperatures, mainly to the south and SE. The continent was even warmer with some anomalous temperatures exceeding 10C in E Europe and Russia. Rainfall for February was about average for the month at 48.2mm, similar to the MetOffice official SE England precipitation figure of 49mm. Global mean temperatures turned out warm again for February, in fact 0.47C warmer than the previous record. A notable atmospheric event that went mostly unnoticed at the surface was a significant stratospheric warming in February (and March). The sudden warming of temperatures high in the stratosphere, much anticipated by the weather community and long range forecasters as a key tool to forecast winter conditions in the Northern Hemisphere, came too late to cause much cold winter weather in Europe. El Nino winters are often accompanied by Sudden Stratospheric Warmings (SSW) events in late winter. Such events can cause cold weather in mid latitudes as pressure eventually rises in the troposphere some 2 weeks after a SSW. The warming during an SSW is truly remarkable, with temperature rises exceeding 80C in a matter of days at 10hPa (30km), from -80C to +10C in some SSW events. An SSW is like inflating a balloon in the high atmosphere, pressure is expected to propagate down and eventually rise in the lower atmosphere some weeks after an SSW. Importantly, the pressure rise often disrupts the zonal westerly flow of the jetstream. This appears as negative anomalies on the zonal wind chart below (blue colours). 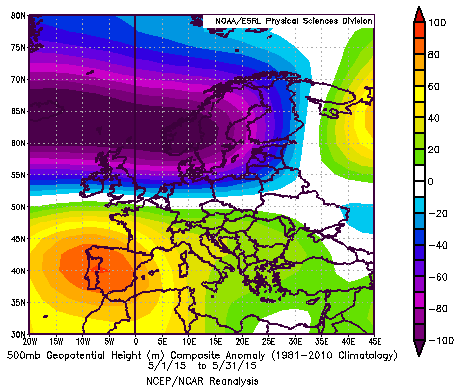 Unfortunately for this winter, the SSW came too late for much significant winter cold to penetrate into Europe. You can spot that the anomalous easterly winds only got going in March… too late for deep cold to push into Europe. The JMA snow charts below also show how February came out as an anomalously un-snowy period for much of Europe. Like the rest of England and Wales, Reigate had an exceptionally warm December and the warmest on record by a huge margin. Central England Temperature December records smashed! This is warmer than any March CET. The gap between September and December’s CET was less than 3.0C, the gap between their respective minima was just 1.1C! The CET mean maximum was 1.8C higher than the previous record of 1974. 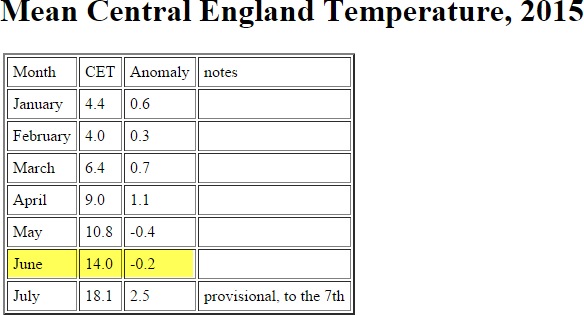 In Reigate the average temperature was 10.1C compared to 5.3C, 5.8C and 6C in 2014, 2013 and 2012 respectively. Whilst our own Reigate records only go back to 2012 (neighbour stations extend this locally back further to 2009), the Central England Temperature record extends back to 1772 and, at 9.8C monthly average, December 2015 smashed all previous mean monthly temperatures by a long way. The official Central England Temperature anomaly (temperature departure from normal long term average) came out at a whopping 5.2C above average, way above previous warm Decembers of 1934 and 1974. The chart above shows the monthly average data in Reigate this year as an anomaly departure from the long term average for SE England – (source MetOffice Hadobs 1910-present). It starkly shows how much warmer December was from the long term average extending back to 1910, Reigate was a full 5.6C above normal! How much is this down to El Nino? As discussed in previous posts the El Nino ENSO Pacific warming natural cycle cannot explain all of this extraordinary warmth. In fact, there is little established link between El Nino and UK winter weather. This is shown in the charts below for previous mega-El Ninos in 1982 and 1997 which had markedly different impacts on our December winter weather. So there appears to be no real solid link between El Ninos and any crazy warm winter / December weather here. Remember that the recent Paris climate change conference has sought to set a target of limiting global temperature rise to no more than 2C temperature increase over pre-industrial levels. Locally we can expect spikes in temperature of course but this 5C anomaly for December, and the fact that 2015 will certainly be the warmest on record globally, shows the huge challenge that lies ahead in keeping temperatures down to less than 2C globally. It was so warm for so long that wild flowers and plants around Reigate such as daffodils, camelias, forsythia and rhododendrons came into flower as if it was Spring. This was a lot to do with minimum temperatures being so high with no frosts recorded at all. Many records were broken across the UK for highest minimums overnight, which frequently stayed in double figures. Indeed, this December has had a similar mean temperature to that expected in May. Our own station recorded the highest December Tmax at 15.5C on 19 December and the highest overnight Tmin at 12.4C on 26 Dec. Despite the record breaking deluge further North which made this the UK’s wettest December of record overall), rainfall in Reigate came out around or even a tad below average at 79mm. Whilst 2014 was drier still at only 49.4mm, 2013 saw 110mm. Regionally, South East England got around the average rainfall normally expected in December. Like November 2015, December continued the sun-less theme with only 79.8 hours of sunshine. Apart from the incredible and perturbing warmth (which extended to the North Pole at the end of the month courtesy of Storm Frank) December 2015 was not remarkable for much else weatherwise locally. Unfortunately, in Cumbria, Yorkshire and North Wales, there was extensive flooding which caused much misery and disruption especially over the Christmas period. For more on the flooding and other weather stories please check this Flipboard magazine account. Have a Happy New Year! 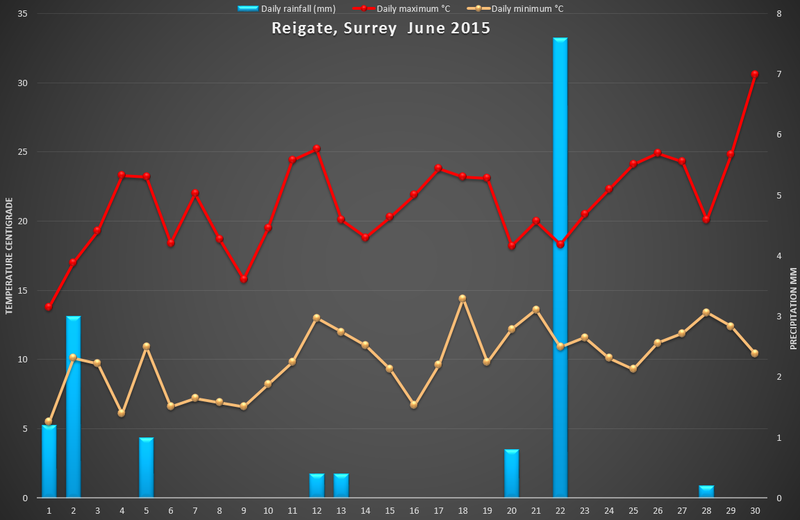 Data for Reigate and 2015 has been updated in the data page. In the UK November 2015 was the third warmest on record since 1910 and averaged 10C in Reigate with Tmax 16.3C and Tmin -2.6C. The overall CET (Central England Temp) for November came out at 9.5C, nearly 3C above the long term average. The month started with a trough in the Atlantic and HIGH pressure to the east bringing a mild wet southerly //SW flow to our area in the south. Rainfall was about average for our area at a total of 66mm for the month, though this is significantly drier than the MetOffice SE data shown below which shows the SE being wetter than average as a whole. 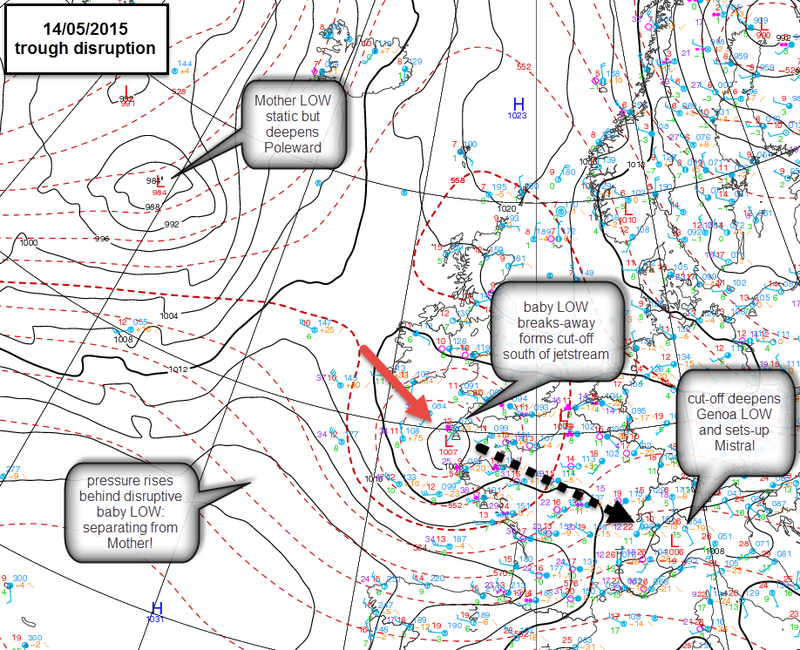 A number of named MetOffice storms impacted the UK but did not significantly affect the SE. Ex-Tropical storm Kate swept unnoticed across the South on the 14/15 Nov and brought some blustery weather to the Downs. Temperatures took a brief dip later in the month when a short-lived Arctic plunge brought brief wet snow which fell and settled momentarily in Reigate on the morning of 21 November. November rain was about average for Reigate, though wetter in the NW. November was the dullest ever on record especially here in the south.